NEW! 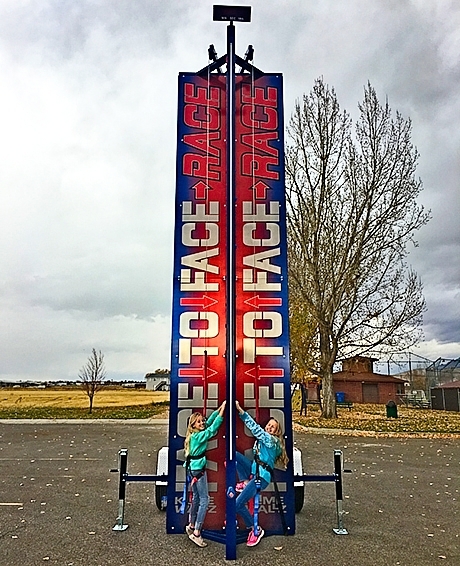 Stare down your opponent as you race to the top of this 20ft tall climbing wall! The LED timer displays the winning time, and an LED light strip flashes the color of the winning side. Speed climbing is set to be the next big Olympic sport. Give your clients a taste of the action with the new Face-to-Face-Race! The Face-to-Face-Race utilizes 3/4″ thick Acrylite GP. This material offers better weather resistance than other types of transparent materials. It will withstand blazing sun, extreme cold, and salt spray. It does NOT yellow in the sun. It is commonly used for skylights, outdoor signs, and aircraft glazing. It is half the weight of glass, and yet has 10 times the impact resistance! Our exclusive Auto-Belay system and hydraulic lift ensure that this climbing wall is safe and easy to operate. One operator can setup in 5 minutes and operate the climbing wall alone. This is the perfect climbing wall for college crowds, inflatable operators, camps, school festivals, tradeshows, birthday parties, and rentals. WARNING – Failure to follow the operational requirements found in your Operation and Owner’s Manual will result in voiding warranties and will place people and property at risk of serious damage and injuries. Any modifications, alterations, misuse, work or service that is performed on your Spectrum Sports Intl equipment or its components that is not performed by an authorized Spectrum Sports Intl employee voids any and all claims to any manufacturer’s liability. It is the buyer/operator’s responsibility to know and understand all regulatory restrictions and limitations that apply to this product in their jurisdiction. SSI makes no guarantee, explicit or implied, that the product meets all requirements in the buyer/operator’s jurisdiction.